Should women avoid running? And should you – male or female – stop drinking coffee? Those controversial messages were delivered by Dr. Michael Fox with his lecture on the Caribbean low-carb cruise recently. One of the more refreshing and appreciated presentations on the Caribbean low-carb cruise was by Dr. Michael Fox. He works as a physician in a fertility clinic in Jacksonville, USA. Since 2004 he has used LCHF for treating women with PCOS (polycystic ovarian syndrome) and who have not been able to conceive. This became a great success! Before they started dietary treatment fewer than 50 % of women got pregnant. With LCHF as part of the concept about 90 % conceive and often within a few menstrual cycles after being advised by the clinic. There are a couple of interviews with Dr. Fox where he talks about LCHF and fertility. For those who are eating LCHF it’s hardly controversial that the diet helps against disease conditions that are associated with the metabolic syndrome. PCOS is most likely one of those diseases. However, it is more controversial that Dr. Fox claims that aerobic exercise is a bad idea for all women and especially so if you want to conceive. The female body perceives prolonged exercise with a relatively high pulse as a life-threatening situation. When this is repeated over and over the body is exposed to stress that makes the brain (hypothalamus) down-prioritize a number of things, one of them may be the ability to conceive. Permanent damage to the brain’s hormon signaling can be observed after only a year of intense aerobic exercise. Dr. Michael Fox therefore recommends that all women stay away from aerobic exercise, such as running, bicycling etc. Men don’t seem to be as sensitive to the stress that aerobic exercise produces. Dr. Fox claims that there are evolutionary explanations to the difference between women and men. Cave men were the ones who were out hunting and probably this is the reason that men can cope with aerobic exercise better. Should women then not exercise at all? No, Michael thinks that weight-lifting a few times a week combined with walks and an active mobile life is the best recipe for health! On the membership pages there’s an interview where Dr. Fox talks more about why aerobic exercise is a bad idea for women. Michael Fox has five children, the last were triplets that came to be without any assistance from the fertility clinic. Some of his colleagues find this hard to believe! Another sacred cow that Michael chooses to discourage from is coffee drinking! Both men and women should avoid drinking coffee (caffeine) several times a day. Caffeine triggers cortisol release (produces a stress reaction.) One effect of frequent coffee drinking may therefore be weight gain or failure to lose weight despite a good diet. 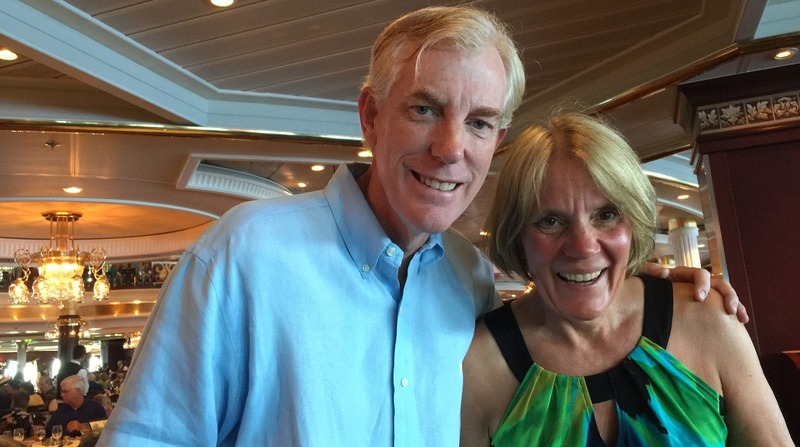 Thank you for the fourth cruise report, Peter! More to come. If you became interested in Michael Fox and want to know more about what he has to say, his entire presentation from the cruise will soon be available on the membership pages. The message about women and running is of course controversial. I think there’s a point, at least when it comes to the chance of conceiving. Women who exercise hard can dramatically reduce their chances of conceiving and this is good to be aware of. Attacking coffee drinking is of course also a sensitive thing. That it causes release of stress hormones seems likely – even though I haven’t seen any studies on this. After having listened to Dr. Fox I tried to go cold turkey myself. This trial lasted only for a few hours before I had to give up – I had too many important things to do on the cruise and it wasn’t OK to be tired with withdrawal symptoms. But since the cruise I have dramatically reduced my coffee drinking to less than half of my previous consumption. The goal is to take a break for a few weeks to see how it makes me feel. Have you tried to quit drinking coffee? If so, how did it impact you? Minor thing, they show a picture of his triplets but the 2 girls are the same picture, right down to the wisps of hair and folds in her top. Both coffee and exercise have been the subject of numerous studies. I'm disappointed to see an article like this in DietDoctor that is based on speculation and the unsupported opinion of one maverick doctor, with no reference to the scientific literature. It used to be that DietDoctor tried to educate its readers how to look past poorly performed scientific studies ("eggs are bad for you"), but this is not even looking at studies at all! I'm possibly wrong about this, but I believe coffee consumption may have a negative impact on my ability to lose weight, although I can't say whether or not increased cortisol is the reason (I have also heard that coffee can cause an increase in blood sugar). My question is whether this is due to "coffee" or "caffeine"? If it's a phenomenon only of coffee, how would someone who stalls on coffee fair on another caffeinated beverage, such as green tea? I quit drinking coffee 3 months ago and it's definitely fantastic feeling. l have more energy and l sleep better . At first 4-5 days l felt tired with low blood pressure and l had craving for coffee but after that l have never even thought again that I need a cup of coffee. At the beginning when you quit with coffee trick is to drink a lot of water. that will support help to regulate blood pressure. The same for TEA, Tea have caffeine too and Iced tea is my drink everyday or in a restaurant. So please, somebody ( Andreas ) can clarify this ... !!!!!!! Is really hard to loose weight for me and also I take two espresso coffee w/ cream a day, could be the reason...? I too am very keen to know if the problem lies with coffee itself or with all drinks (and chocolate) that contain caffeine! With coffee there may be a distinction between low quality offerings (the majority of the market) and high quality ones. Lower quality offerings are often over or under roasted, have higher caffeine and many places use way too much coffee relative to water for the respective serving. As a result, lousy coffee is often doctored with copious milk and sugar to compensate. I have quit coffee for up to 3 months, it did kick the habit of dying without it, I can go without and be fine, it cut down some tension, but as far as weight no difference, now that being said I was not on the lchf diet at the time, I drink coffee as leisure, with my coconut oil, but I'm quite alert in the morning and start by drinking 16oz of water before I even think about coffee and then drink water after, it is my only caffeine source. Regarding coffee, I gave up last August, 10 mos. ago due to heavily stained teeth, and according to the dentist, some alveolar bone loss, which could be genetic, but could also be due to caffeine consumption. I'm 58 and have been drinking coffee since my teens, with the last 5 years adding an espresso or two a day. Since giving up coffee, my teeth (and breath) are much much better ( no alveolar bone growth though). Side benefit includes much better sleep and also an even mood throughout the day- no ups or downs...admittedly I miss the ups that a strong espresso gives for an hour or two, but all in all, I'm happy I gave it up. I quit caffeine for about a month each fall, because it makes a long religious fast much easier to tolerate. But no appreciable difference in my weight (even after the fast!). The venerable "blue zone" Okinawans drink plenty of green tea. It doesn't seem to hurt their fertility. My face kept breaking out, even though I had stopped eating dairy, nightshades, nuts and eggs. After reading the information on AIP from the Paleo Mom blog, I gave up chocolate and coffee (seeds). It has been 3 weeks and my face is almost healed. I don't miss it, and drink decaffeinated tea during the day instead. I drink 2 to 4 cups a day of real coffee and that has no impact on my weight. Of course my coffee is not loaded with sugar, I put whole milk only. If he's right about women not running, why wouldn't the same hold true for men? There's a difference between running for exercise and running so much that one stops menstruating. If it were really true that the body perceives running as running from a tiger, say, the same would hold true for men. I'd have to see the body of evidence for that claim vs. the body of evidence that exercise improves the health of both sexes. Also, as someone pointed out above, Authority Nutrition has written extensively about the evidence that shows coffee/caffeine is good for us on balance. This giving up coffee business is nonsense. Just google coffee+health and you'll read about all the health benefits of coffee. Coffee is not the dreaded beverage of the 1980's-1990's, where all we read about were health scares related to it. Not so anymore. Coffee is even related to less mental depression in populations that drink it. Of course too much of anything is not good. I say find your comfort level (where you're not nervous, anxious and can sleep at night! ), then enjoy it without sugar or fake creamers. I'm sorry but axing coffee seems irresponsible to me. So many things cause rising cortisol. Just don't drink a gallon a day for pete sake! re: Have you tried to quit drinking coffee? If so, how did it impact you? Several times, with no particular issues or benefits, if I wind down the consumption over several days. Stop cold turkey : headache. Other leading diet advocates, such as Dr. "Wheat Belly" Davis, recommend coffee as a weight loss aid. This debate is apt to remain unresolved for a long time. And of course, we must be clear that we are speaking of black caffeinated coffee ... and one wonders about organic, single-origin, high altitude, and how processed, etc., etc. Look for Phil Maffetone. His method of training is reduced in stress, improve fat burning and performance which is perfect for LCHF diet. Several times in my long life I've decided to give it up. I went through the headaches and other terrible withdrawal symptoms. Stubborn, I am. So I followed through and gave it up every time. Several months following the "give up coffee" process, I always asked myself, "Why did I do this? Has it made an impact on the quality of my life?" The answer was always the same, "No!" I consider the doctor's theory in this matter a crock. One comment about the website: I looked everywhere trying to find the interview with the esteemed doctor, and couldn't find it. The GUI needs tweaking, guys. Glenda. It's in the member "Interviews" section. You must page down to the older interviews. It is there. But you must be a member to see it. Bottom line, the benefits, if any, weren't worth the cost of quitting caffeine. Wow. Lots of caffeine addicts here. I have taken up having a cup of decaffeinated coffee in the morning first thing, with come cocoa powder, mostly because of the evidence of the benefits of both, and I have come to enjoy it. But I certainly don't need it. I generally don't have any on weekends or on trips. If I were to suffer performance-diminishing side effects of withdrawal, that would make me rethink whether I should be consuming that much caffeine. I think Dr. Fox is taking extreme examples out of context, and applying them to a population as a whole. Women should not run? So when the neighboring tribe / saber tooth tiger / tornado invades your village the women should do what? Excessive and chronic cardio done for hours on end is catabolic. Short and reasonable quantities are beneficial. As for coffee, after I started LCHF I developed a poor tolerance to coffee and caffeine. After a while I could not even drink too much decaf and quit coffee for a year. I found no difference in my weight and little difference with productivity, if any. After I (and my wife) started running 3 to 8 miles per week, I found I could up my carb intake and my tolerance to coffee returned. I don't know if how these are related but I do think caffeine does have metabolic effects. If I exercise within one hour or so of a meal, I am sluggish and fatigued for the first 15 minutes or so. If I have a coffee before hand, no sluggishness. Not sure if running is an important enough highlight in today's world, where more and more women are choosing to have fewer children or even child-free. Going to have a coffee now before my 2 hour run. Seriously, the worst post so far on this site I can remember. There is no scientific proof that running has any effect on fertility that I know of. Most direct link to my knowledge which is indirectly linked to running is body fat content and the ratio of nutrient intake / total kcal used. And this can be true as well for any other female athlete as well as women not performing any sport. Maybe people should try and read the Doctor's actual lecture before they blast it. This is only a report on the lecture. Coffee may raise cortisol and lead to weight gain. Running regularly might be bad for women. Neither statements may turn out to be true. Most people here seem to support or blast this Doctors opinion based on whether or not they like his conclusions. I love running and I love coffee. I have given up sugar, grains, and all processed foods. Please don't take my running and coffee away too. The report on the lecture is pretty clear. So you are saying the report does not accuratly represent the lecture? What is worse? I have never drunk coffee so I don't have a before and after to compare but I will say that I have always been bemused by those who seem to struggle in the morning before they have that first cup of coffee. I am always alert and up and out first thing in the morning and I don't need coffee to do it. Is coffee really that addictive that people find it hard to go without it? If it is I don't think it can be a good thing. I'm not as dismissive of Dr. Fox's views as others. First, I have a high regard for empirical data. His expertise is fertility treatment and this represents observations from experiences. However, I would restrict the implications to women trying to conceive and having difficulty, as that is the group from which he has derived empirical data. To assess whether it is plausible in general, one needs to understand the metabolics better. Running is no doubt a stress on the system. However, some stress is always good and too much is bad. The difficult question is how much is too much, and that can vary from person to person depending on their conditioning, general stress levels and metabolic health. Also, running at different paces has qualitatively different effects. Dr. Phil Maffetone, for example, advocates training to burn fat on LCHF with heart rate no higher than 180 minus age. Going above that heart rate sends stress signals and fires up carb-burning metabolism. As Dr. Fox says (quoted above): "The female body perceives prolonged exercise with a relatively high pulse as a life-threatening situation." Note the "relatively high pulse" qualification: sugar burning pulse. There are several studies showing cardiovascular issues with a disturbingly high percentage of marathoners who run above fat-burning zone, especially with carb-loading. Other studies show diminishing health returns once weekly running exceeds 8 kilometres. A heart that starts burning sugar is destined for trouble over time, so the longer in sugar-burning zone the greater the likelihood of heart arrhythmia, for example (caused by mitochondrial damage from burning sugar too long). Runners from back in the 1970s used to refer to training in the zone above fat-burning and below sprint as "junk miles." Long, slow, distance was the mantra back then. Now the Dutch skating team trains 70% LSD and they dominated at the 2014 winter Olympics. So there is likely a grain of truth in the caution for people generally with respect to excessive running at a "relatively high pulse." I had stopped endurance sport a few years ago based on the data until I could sort it out. I have since restarted, confident that going low carb and emphasizing LSD training and sprinting is okay on reasonable interpretations of the data. As for coffee, there are studies showing clear benefits to coffee. It seems caffeine tolerance is variable, person to person and with diet. I, too, seemed to get more caffeine sensitive with lchf. However, I find that really potent 100% chocolate (direct from beans, with mild roast and minimal conching) will affect me, whereas the same chocolate when eaten with quality butter does not have the effect. The French, as usual, are geniuses of cuisine in that most of the dark chocolate recipes incorporate butter or cream. So how does the suggestion we give up coffee sit with those on LCHF diet who drink bulletproofcoffee (BPC)? I agree that this post doesn't really fit in to the "dietdoctor" concept of scientific proof statements about food on this website. For the runningpart of this article; I have never been a great fan of running or high intense exercise like aerobics, it always feld like I was pushing my body to much over it's "limits".. I rather go for a long walk with my dog or take my bike into the woods to have the exercise I need. For the coffeepart; In the past I also quit a couple of times. I thought my migraine was triggered by the caffeine. Sometimes it worked, sometimes it did't. Since I eat LCHF I finally understand that my migraine was'nt triggered by caffeine but by my high carb diet.. My migraine is gone, the keto state of my body works really good for my brain! I also do not "depent" on coffee to start my day, can do without it, but I just enjoy the taste of it! There are loads of contradictory studies on coffee. It's an anti-oxidant and it's not at all linked to "stress". Show us a real study. I am on my third day of no coffee. I haven't notice any difference at all other than my digestion seems slower. As I understand it, caffeine structures for coffee and tea are very different. I have been drinking a bowl of matcha in the mornings -- I do find it helping with my extraordinary appetite in the morning. I used to drink 20-30 oz. of coffee a morning to sort of "fill-up". I even tried the butter in coffee as a way to help with my morning appetite. I did find that to be very helpful. So far it seems like matcha is a better ounce for ounce filler-upper. I think the coffee thing is more aimed towards women with hormone/endocrine issues. Coffee has had a negative effect on my hormones and i have pcos. ok two things nobody answered the question about the triplets the girls are one and the same , where is the pic of the second girl? and im glad there is so much more of the written articles as apposed to the videos in this weeks newsletter/blog . i like to read the articles not watch them .my mind wanders and i zone out .so please keep the printed word going. thank you! I haven't been able to drink coffee on a daily basis for years. The occasional cup is a rare occurrence. Apart from the hyped/stressed feeling, that takes hours to get over, the joints in my hands, particularly the base of the thumb to wrist joint, ache and get stiff. That can't be a good sign:)! Ditto Linda, I concur wholeheartedly. I think for most people who can bring their bodies back into balance on an LCHF diet, all they need do is manage sensibly those things that they like/make them feel good (eg. coffee, chocolate, exercise, alcohol, etc). As our parents used to say - 'everything in moderation'. Reminds me of a couple of other sayings, 'living is a health hazard' and 'don't take life too seriously, none of us are getting out of here alive'. Research shows that those who exercise aerobic have a third less cancer rate. Those who drink coffee have the same. And those who drink coffee and exercise, have two thirds less cancer. Those who are obese have problems with fertility. Weight loss increases fertility. Since most women spend most of their lives not wanting to get either pregnant or cancer, I place my vote with drinking coffee and exercising. I believe the issue with weight loss is what goes with the coffee. I use high fat cream and no sugar. I exercise, run, and do yoga and other cross training exercises. I eat what I call a carnivarian diet with as much fat as possible. In six months without measuring portions, I have lost over twenty pounds, and counting. Weight bearing exercise reduces osteoporosis. And I eat two meals a day, most days. On the rare occasion I add raw fish or ceasar salad for lunch, more for social reasons, because I only really eat one good meal a day, and in the am, two eggs, boiled. I feel good. I have lots of energy. I can go eighteen hours some days between eggs and dinner, without losing cognitive focus. My triglycerides are low, and I sleep like a baby. Quit sugar? Most definitely! Quit high fat cream and coffee? Not going to happen! I love lchf plan. As far as coffee ....15 years off it....2 weeks ago I had. A sip of a latte.....I was flying with adrenalin...As for running....I am a dancer...swing, ballroom, Cajun zydeco and country...running....ouch...the knees do not like it. At 70 tears old I am in great shape...flt with flat belly....thank you diet doctor..stay healthy all!!! I am 38 years old and never drank coffee regularly. I´d say in all my lifespan I have had 20-30 cups, normally being social. I don´t like the taste so that probably helps. I am on HFLC Ketogenic since 1 year. By just reducing my carb intake I have felt my energy to be really stable. I just try to sleep 7-8 hours a day, and never felt the need of coffee. In the past when I was eating HC meals I was on the needs for a nap after lunch.